Oliver, Charlie and Lulu love to play outside together. 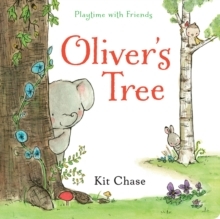 Their favourite game is hide-and-seek, but sometimes it's not fair for Oliver the elephant because his friends can hide in trees where he can't reach them. So the friends set off on a search for a tree that Oliver can play in as well. In a story style reminiscent of Goldilocks on the hunt for the perfect bed to sleep in, these three friends try out several trees, but none are quite right (there's a reason why we don't see elephants in trees!). When Oliver finally gives up in frustration, his friends build him a "tree house" to surprise him--and also provide the perfect place for them to play!